Den 9. april 1944 styrtede B17 42-39936 ned ved Meltofte på Lolland. Se Google Map p280. Det var på hjemturen fra et bombetogt til Poznan (her). Belgien. (Kilde: FAF) Kom i tjenesten fra Louisiana. Oak Leaf Cluster. (Kilde: ABMC) Se Monument for 46 amerikanske flyvere. On 9 April 1944 B17 42-39936 crashed near Meltofte on Lolland. See Google Map p280. It was on the return flight from a bombing raid on Poznan (here). "The two inner engines of the plane caught fire after hits from a number of attacking FW 190s. 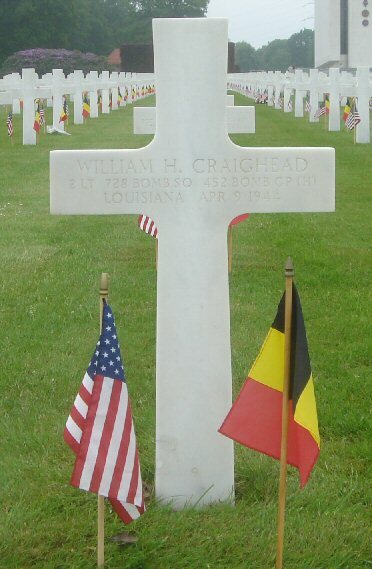 2nd Lt (Bombardier) William H. Craighead drowned south of Kramnitse. His body was found drifted ashore at Tjørneby on 31 May 1944. In 1948 he and other American airmen from Svinø were taken to Ardennes American Cemetery in BELGIUM. He stills rests there. Buried at: Plot B Row 39 Grave 9.